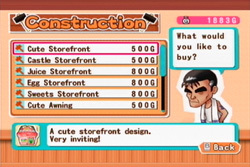 Takakura runs the Construction shop in town. At the beginning of the game, his goal is to tear down Grandma Sharon's shop. After you take over the shop, he has a change of heart and decides to leave it alone. You can't buy anything from Takakura until after you see an event involving Danica and Tak. Danica has come to Clover Town to be his apprentice, but Takakura doesn't have a need for one. She is persistent though, and the old man finally gives in and assigns her a room to live in at his shop. After that you can purchase items. On your farm you will have two crop fields. If you want to have the remaining 3, you need to buy them from the carpenters. The main merchandise at their store are shop remodel pieces. You can buy various styles of storefront, awning, and roofing to remodel your store. There doesn't seem to be any in-game advantages to changing the outside looks of your shop. You can also buy "stickers" that can be pasted as decorations onto your shop. For images of the store remodels and decorations, please check the Store Remodeling page.